Pranav Jani joined Ohio State in September 2004 and works on postcolonial literature and theory in the English department. 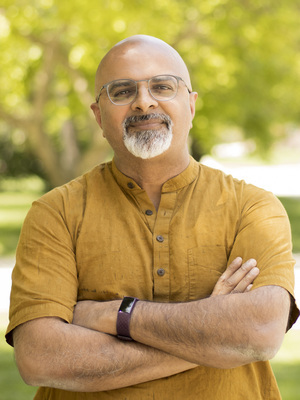 His teaching is focused on South Asian and African writing and film, with a developing interest in literature from other colonized places, like Ireland, the Caribbean, and the Arab world, and South Asian culture in the US. Pranav's interest in non-Western and US ethnic literature is driven, ultimately, by personal and political affiliations. Well-versed in Hindustani vocal music and Indian languages, formerly-versed in tabla, and a man who can make a mean rajma curry, he has always tried to meet the hyphenated identity thing head-on. ; Finally, Pranav's commitment as an antiwar activist and socialist has simply solidified since racial profiling has gotten, shall we say, more diverse and more personal after 9/11.